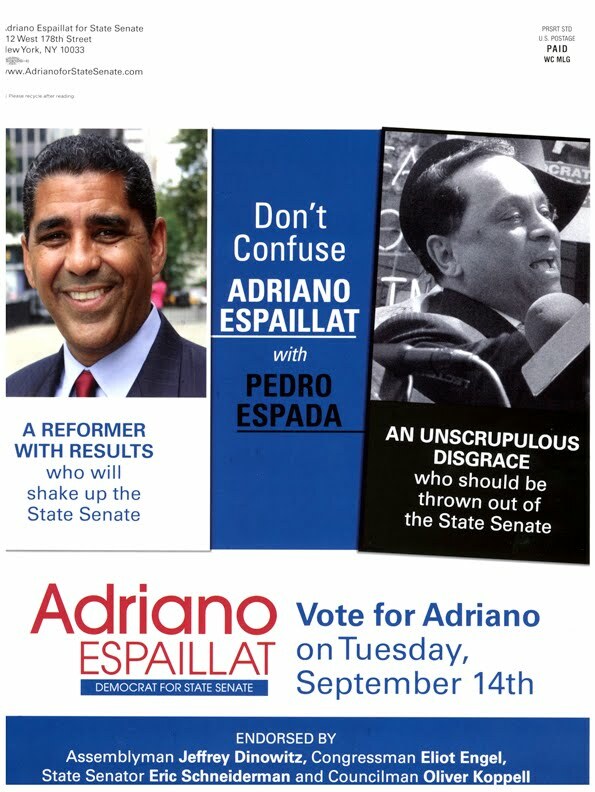 Looks like Adriano Espaillat's campaign thinks he has an Espada problem -- that is that voters may confuse the assemblyman who is running to fill the 31st District Senate seat of attorney general hopeful Eric Schneiderman with Pedro Espada, the incumbent state senator in the neighboring 33rd District. 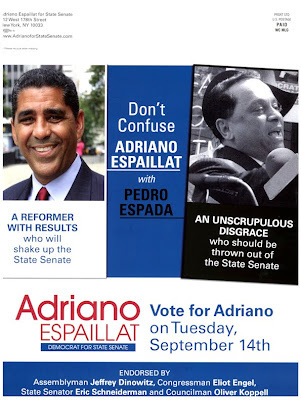 They're both Latino of course and share the first four letters for their last name, but Espaillat apparently wants to make sure that voters know the similarities end there. This flier was distributed in at least one building in Riverdale this morning. Says Who? Is there a difference? I have to apologize to the people of the State of NY; I've been biting my tongue, fearful that if I write what I truly think of Attorney Schniederman it will lead to Anna Lewis's defeat. There are 2 BIG secrets in NYS. The one that is the least kept BIG secret is that Prime Minister Sheldon Silver is a Personal Injury Lawyer and he refuses to bring tort reform before the Assembly floor. The second AND THE ABSOLUTELY BEST KEPT SECRET IS THAT THERE ARE 20 MEMBERS OF THE NYS BAR, 19 PRACTICING LAW IN THE NEW YORK STATE SENATE! If you had 20 farm owners (Ag still the biggest industry in NYS), 20 doctors or 20 Commercial Fisherman in the Senate you would say there is something fishy going on in NYS government. Instead we have those that live off the law practicing the law. We don't have a government for the people; buy the people, of the people. We have a government for the attorneys; buy the attorneys of the attorneys. Do you honestly think that if Silver were replaced by a non-attorney that allowed tort reform on the assembly floor that tort reform with 19 attorneys practicing law, some from some pretty hefty size law firms, that tort reform is going to break committee in the Senate. It's Schneiderman that has shot himself in the foot here, for he has shown his hand. No one seeking the office of Attorney General should be showing favoritism toward one candidate or another. It shows just what kind of Attorney General we will be electing. Do you think if he suspects wrong doing he will go after Espaillat, his 18 former fellow members of the NYS Bar or will he put that folder on the bottom? Why isn't there an indictment against State Senator George Winner (attorney George Winner)? Do you think another attorney in the Senate or Assembly will be prosecuted by State Senator-attorney Eric Schneiderman if he is elected Attorney General? I think not, like State Senator George Winner, they will be allowed to quietly retire, pardoned not by the Governor, not denied their $80,000 pension,never forced to give any money back to NYS, instead pardoned by Eric Schneiderman, AG! The NYS bar already controls the assembly with Prime Minister Sheldon Silver at the helm, 20 seats in the Senate, now, if elected, one of those elite 20 is going to be AG! Schneiderman is the last person we want to elect as AG and because of conflict of interest issues as a partner in the Kirkpatrick & Lockhart Law Firm; he should never have been elected to the state senate in the first place. Schneiderman and Lewis are not colleagues; they are very much rivals and travel in very different circles, that’s why it may not be the end of the World, but she has to be one of the newly elected (no conflict of interest) members of the 2011 NYS Senate.